VBAC Delivery | PELV-ICE LLC. A conversation with a mother who gave birth 20 years ago would reveal that the wisdom of the day was if you have one c-section, every birth afterwards has to also be a c-section. The fear of uterine rupture and delivering in hospitals not equipped for emergency intervention was much greater in the past. 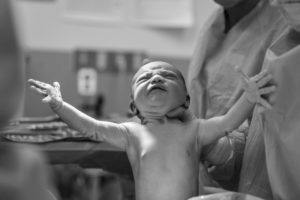 Changes in how a caesarean surgery is performed have allowed for more women to attempt a vaginal birth after having a c-section. This is referred to as a Vaginal Birth After Caesarean, or VBAC. About 70% of women who attempt a trial labor after caesarean (TLOC) are successful, but the success and reasoning behind having a VBAC, or not, vary depending on a battery of circumstances. First, many hospitals will not allow VBAC births because they are not set up to handle an emergency uterine rupture surgery. Though there is only a 1% chance of a rupture occurring, many clinics won’t take this risk. So women who want to attempt a VBAC should discuss this with their provider early in their pregnancy to make sure they are not only a viable candidate, but find out if their doctor’s office will allow it. There are many reasons why women choose to have a VBAC even with the associated risk. Which includes avoiding major surgery, a shorter recovery time, and wanting to experience a vaginal birth, especially for those who want a larger family, as multiple caesarean scars can make surgeries harder and increase the likelihood of placental problems. Obviously the main risk associated with a VBAC is uterine rupture, which could lead to emergency surgery and possible uterine removal if the bleeding cannot be stopped. To prevent risk for mother and baby, a conversation about the woman’s medical history and factors should be discussed with her health care provider to create her individualized birth plan. How should expectant mothers prepare for vbac?